Dreaming of an epic summer roadtrip? How about a relaxing day lounging on the beach soaking up the rays? January seems to give us ideas of fresh goals and better habits, while also making many of us dream of getting away from our dreary, cold weather. But if you’ve got plans to take a trip, you should use my travel budget vacation cost worksheet to find out how much you need to save for your trip. Then you can use any or all of my 12 ideas on how to save for a vacation and travel with peace of mind knowing your trip won’t be putting you into debt! You may have seen my post about the average vacation cost, but this worksheet (available to my subscribers) will help you dial in what your actual estimated costs will be. Perhaps you need more room than the average traveler, or maybe you eat more? Whatever your preferences are, this travel budget vacation cost worksheet will help you dial into your estimated average vacation cost. Here you can figure your costs whether you decide to fly or drive. If you fly then you can total your airfare, baggage fees, parking, and destination car rental or transportation. If you choose to drive then you can estimate your fuel expense by using a MPG/miles driven calculation. This doesn’t take into account the wear on your car or any maintenance you’ll need to perform before traveling. Whether you stay at a hotel, B&B, rental home, or campsite, input your nightly rate and number of nights. Don’t forget to include the taxes that will be added onto your lodging as they can often add around 10-15% onto your room rate. You should also consider budgeting for bell services if the hotel has that amenity as well as planning on tipping your housekeeper. A good rule of thumb is $1 per person per day, depending on mess or service needs. Many hotels are starting to charge daily resort fees or fees for parking and internet, so be sure to budget for any of those add-ons if needed. Do youR research online about what attractions you want to visit and what the admission fees are for them. You can also typically find parking fees listed on the attraction’s website if you’re planning to drive and park. Decide what your souvenir budget is and make sure you inform your kids. We like to give our girls a flat amount and they can choose to spend it whenever they want, but once it’s spent, it’s gone. This is a hard section to help you budget for because we all have different feelings about food. If you happen to book a hotel with free breakfast, you can save some money in this section. Also, if you’re eating at nice restaurants or theme parks, these estimated amounts might not be enough. I’ve tried to give you a ballpark figure so you can still have an idea on what to budget. If you’re wanting to eat at nice restaurants each evening, just bump up your dinner total. If you’re going to buy groceries and eat-in each evening, you’ll save on dinner costs but need to include grocery expenses. 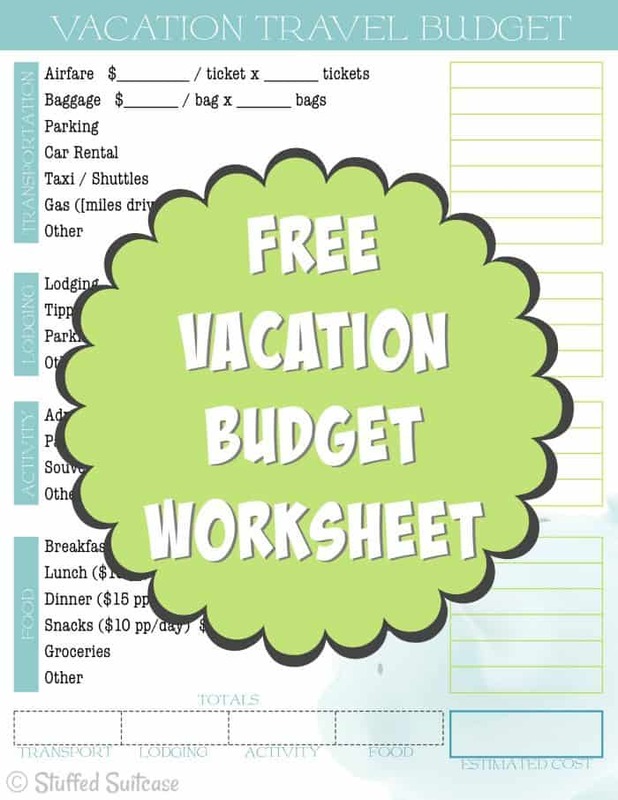 My free printable travel budget vacation cost worksheet is available for all of my weekly newsletter subscribers, so please subscribe below! If you already subscribe, there is a link to the subscriber downloads at the bottom of the newsletter. If you have any difficulties, please let me know. It should have been on the page that loads when you confirmed your subscription? Maybe it was a glitch? Did you confirm your subscription? Let me make sure you’re listed and I’ll get the page for you! Sorry for the confusion! I had the same issue. I subscribed and confirmed and there were no links. How do i get to the worksheet? Ugh, sorry you had trouble too Dottie! I even went into my email list and made sure it was set to redirect on confirmation. I’ll send over the sheet right now! I also signed up for your newsletter and didn’t receive a link for your printables. Please help. So sorry about that Pamela. No idea why it works for some and not others! I’m emailing you the printable page right away! I’ve actually been a subscriber for a while but this is my first time trying to get a printable. It isn’t working for me. Just emailed the vacation budget printable to you Tira! I subscribed and lost my place when trying to download. Hi Marisha – I’m not sure I understand. Did it take you off the webpage? I might need to check that setting, my apologies! Let me know if you got the worksheet ok and if you need any further info! I love your website & have used your travel budget planner worksheet in the past. I cannot find it in any of my files/websites/pins, etc. I updated my subscription this morning and still cannot access it. Would you please, please, please send me a copy? Just emailed the link to you, Polly!